Posted on March 2, 2013 by Mrs P.
The 2013 Independent Foreign Fiction Prize longlist has just been announced and features a pleasing number of works that draw on crime genre conventions. The prize was set up in 1990 and ‘honours the best work of fiction by a living author, which has been translated into English from any other language and published in the United Kingdom’. It also makes a point of splitting the £10,000 prize money between the winning author and the translator, which highlights the crucial and often overlooked role of translators in allowing us to access fine international writing. A Dutch woman rents a remote farm in rural Wales. She has fled from an unbearable situation having recently confessed to an affair with one of her students. In Amsterdam, her stunned husband forms a strange partnership with a detective who agrees to help him trace her. They board the ferry to Hull on Christmas Eve. Back on the farm, a young man out walking with his dog injures himself and stays the night, then ends up staying longer. Yet something is deeply wrong. Does he know what he is getting himself into? And what will happen when her husband and the policeman arrive? Gerbrand Bakker has made the territories of isolation, inner turmoil and the solace offered by the natural world his own. 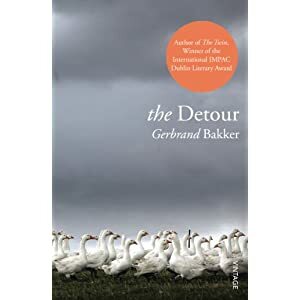 The Detour is a deeply moving new novel, shot through with longing and the quiet tragedy of everyday lives. Two men have been enlisted to kill the head of the Gestapo. This is Operation Anthropoid, Prague, 1942: two Czechoslovakian parachutists sent on a daring mission by London to assassinate Reinhard Heydrich – chief of the Nazi secret services, ‘the hangman of Prague’, ‘the blond beast’, ‘the most dangerous man in the Third Reich’. His boss is Heinrich Himmler but everyone in the SS says ‘Himmler’s brain is called Heydrich’ [Himmlers Hirn heißt Heydrich], which in German spells “HHhH”. All the characters in HHhH are real. All the events depicted are true. But alongside the nerve-shredding preparations for the attack runs another story: when you are a novelist writing about real people, how do you resist the temptation to make things up? HHhH is a panorama of the Third Reich told through the life of one outstandingly brutal man, a story of unbearable heroism and loyalty, revenge and betrayal. Denmark’s foremost literary author turns crime fiction on its head. Bess and Halland live in a small town, where everyone knows everyone else. When Halland is found murdered in the main square the police encounter only riddles. For Bess bereavement marks the start of a journey that leads her to a reassessment of first friends, then family. Maxine Clarke’s review of this novel is available on the Euro Crime blog. No sooner does he get to know Ricardo Laverde than disaffected young Colombian lawyer Antonio Yammara realises that his new friend has a secret, or rather several secrets. When Ricardo is shot dead on a street corner in Bogotá by a guy on the back of a motorbike, Antonio is caught in the hail of bullets. Lucky to survive, and more out of love with life than ever, he starts asking questions until the questions become an obsession that leads him to Laverde’s daughter. His troubled investigation leads all the way back to the early 1960s, marijuana smuggling and a time before the cocaine trade trapped a whole generation of Colombians in a living nightmare of fear and random death. Juan Gabriel Vásquez is one of the leading novelists of his generation, and The Sound of Things Falling, which tackles what became of Colombia in the time of Pablo Escobar, is his best book to date. The shortlist for the Independent Foreign Fiction Prize 2013 will be announced on 11 April. The full longlist can be found here. Looking forward to sampling some of these soon!